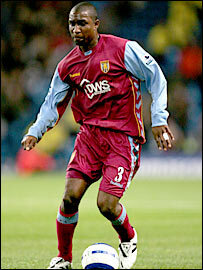 Aston Villa full-back Jlloyd Samuel will not be able to play for Trinidad and Tobago after a ruling by Fifa. Samuel has played for England Under-18s and Under-21s and featured - without playing - in the senior squad for the friendly against Sweden last year. The 24-year-old was born in Trinidad and wanted to switch allegiance. But Fifa ruled Samuel is too old to be allowed to play for another country as applications can only be made by players who are under 21. "We have noted that Samuel has not played for the England senior team but also that he was born in 1981," said Fifa's Heinz Tannler. "In principle, a player can request once changing the association for which he is eligible to play international matches - but only up until his 21st birthday - and Samuel is 24." Trinidad and Tobago are in a two-legged play-off against Bahrain for a place in the 2006 World Cup. "I've played for the England Under-21s and I'm sure some people will accuse me of jumping on the bandwagon but I feel Trinidadian and want to play for them," said Samuel. "I was born in Trinidad and it would make me proud to play for them." Samuel is allowed to appeal against the decision, but is thought unlikely to succeed.